DOCTOR WHO Christmas Prequel Tonight! The charity program will feature a specially made prequel to the DOCTOR WHO Christmas episode. The story is a stand-alone and leads directly into episode six of series seven. An exclusive trailer for the Xmas episode will include Matt Smith and Jenna-Louise Coleman onscreen and in character as the 11th Doctor and his new companion, Clara. To the right we see a photo released to promote the special program, and the Doctor (Matt Smith) certainly looks a lot darker than usual! 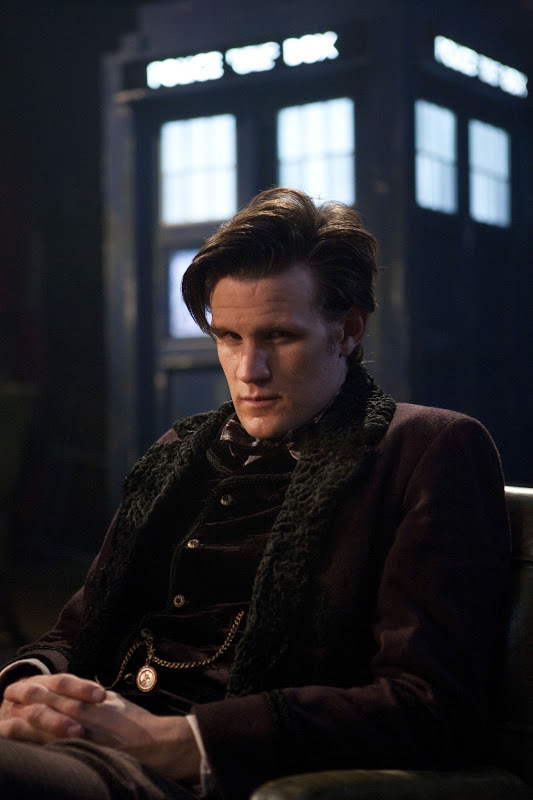 It’s rather broody, suggesting the Doctor’s anguish over the loss of Amy and Rory. And, he’s outside the TARDIS. Follow the jump for a look at Jenna-Louise in costume! Something that sometimes helps when we’re going through a bad situation – such as the one we in the New York City region are enduring this week with Superstorm Sandy – is to remember that there is always someone worse off than yourself. I don’t mean that in a schadenfreude way; I mean it in a humanitarian way. The BBC’s annual CHILDREN IN NEED telethon raises money for grants to finance projects that help disadvantaged youths throughout the U.K. DOCTOR WHO has long been a part of that effort by providing specially created features to lure people into the watching the telethon and making donations. In the past, DOCTOR WHO programming has ranged from the legendary Curse of the Fatal Death (written by our pal Steven Moffat) to Time Crash (Moffat again) to the… um, unusual piece, Dimensions in Time (not Moffat). At any rate, the show has always pitched in, and the 11th Doctor’s era carries on that tradition.